In Anna Toth’s studio, working-class denim is reimagined as elegant jeans and jumpers, a transformation that, in March, prompted judges to name Toth co-winner of Charleston Fashion Week’s Emerging Designer Competition. Winner of the People’s Choice award as well, Toth turned heads with her signature high-waisted, slim-cut jeans and other denim-based female apparel. Owner of Bow + Arrow, she was one of 20 East Coast designers selected to show their fall collections at the prestigious annual fashion fête. Jeans are what Toth, a UNC Asheville graduate who learned pattern-making at the Apparel Arts institute in San Francisco, is best known for. Receiving customers in her light-filled studio in Asheville’s River Arts District, she takes 11 measurements from the waist down. Sixteen pieces of fabric go into each pair. 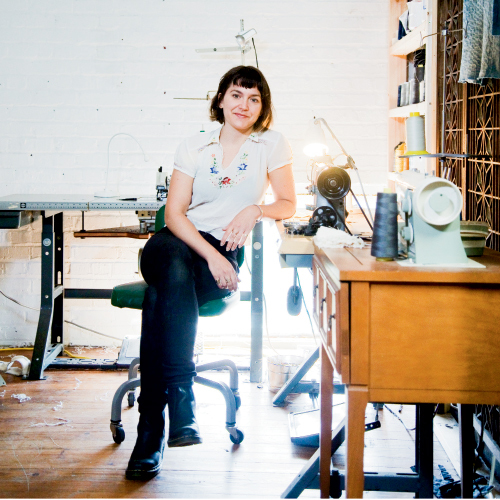 Listening to podcasts and music, she stitches the cuts together on a large industrial Singer sewing machine behind bolts of fabric and spools of thread. When pressed, she can produce a pair in two and a half hours. Winning in Charleston, the town of her birth, was eye-opening in many ways, not the least of which was the creative license it demanded. For three months, Toth shut down her popular Etsy site to dream, draw, and discard. Inspired by men’s work clothes, she came up with a feminine fall line that includes dresses, blouses, jumpers, jackets, and skirts. She’ll add them to her collection, as soon as she and a fashion photographer finish shooting her look book, one of the perks of her win.